With Lok Sabha elections round the corner, President Ram Nath Kovind Friday gave a clarion call to people to perform the "sacred act" of voting, emphasising this year's polls should be seen as a "once-in-a-century moment" that will shape the India of the remainder of the 21st century. 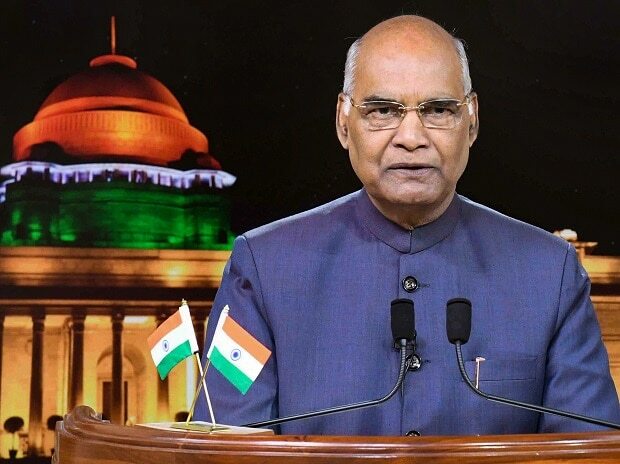 In his customary address to the nation on the eve of the 70th Republic Day, the President said development of the country cannot be completed without a salute to the "spirit of inclusiveness and pluralism which rests on a "tripod of diversity, democracy and development". "This country belongs to each of us and to all of us every group and every community, every region and every identity. It belongs to every citizen and every individual. India's pluralism is its greatest strength and its greatest example to the world. "The 'Indian model' rests on a tripod of diversity, democracy and development. We cannot choose one above the other; we must have all three and we will have all three," he said in the address that was telecast and broadcast across the country. Referring to the general elections that are due before June, the President said it will be the first when voters born in the 21st century will contribute to electing a new Lok Sabha. The election represents the diverse and singular urges of the people and the Republic of India, he said. "This makes the very act of voting a sacred act. Please perform this act. Who the voter chooses to vote for is up to him or her, I would only request all eligible voters to go out and vote. "Our country is at a key juncture. In some respects this is as critical and formative a period as the late 1940s and early 1950s. Decisions and actions of today will shape the India of the remainder of the 21st century. As such, this is not just a once-in-a-generation moment it is a once-in-a-century moment," he said. The President said this election, in which the ideas and idealism of democracy will come into full force, is only a milestone in the journey towards fulfilling the aspirations of the people and building a developed India. While appreciating the role of successive generations in nation building, the President reminded the people that "our voyage is far from complete." "There are still waters to cover, still gaps to fill and still tears to wipe." "We have to recalibrate our yardstick of achievement and success from quantity to quality; from a literate society to a knowledge society; from a nation that has room for all segments and all communities to a family that invokes, encourages and celebrates the uniqueness and potential in each person each daughter and each son," he said. He said the ideals of Mahatma Gandhi of all people living in perfect harmony are a constant reminder while building the nation. In an apparent reference to the 10 per cent quota for economically weaker sections in the general category, he said "the recent constitutional amendment to provide special facilities for talented children from poorer families is another step to an India of our dreams and of Gandhiji's dreams." The President also advocated the need for engaging in conversation with groups who have been historically disadvantaged. "Partnerships are enhanced by open communication, honest conversation and unstinted compassion....This is also true with sections or groups that have been historically disadvantaged and whose grievances must continue to be heard and addressed. It is important to create avenues for such conversations, even if they are inconvenient. "In a society experiencing rapid change, we must be prepared for such conversations. And similarly we must be alive to the need for compassion to those less privileged than us and to the differently-abled, for example," he said. The President stressed that the vision of India's Republic was to reach democratic goals by democratic means, pluralistic goals by pluralistic means, enlightened goals by enlightened means, inclusive goals by inclusive means, compassionate goals by compassionate means and constitutional goals by constitutional means. "May those principles always illuminate our path! After all, 'We, the People ' gave ourselves this Constitution and 'We, the People ' are the custodians and upholders of its principles," he said. He said the best indicator of social change in India is change towards gender equity and towards providing equal opportunities, under conditions of equality, to every girl child and every woman. "...Young women in our country are moving ahead in every field - from academics to the creative arts, from sports to the armed forces. There is no stopping and no hesitation in this process. It is the route to India's future," he added. Kovind said this year also marks 150th birthday anniversary of Gandhi ji which will be followed by the 70th anniversary of the adoption of the Constitution. "In his (Bhimrao Ambedkar), honour and in our Constitution's honour, the nation will celebrate Constitution Day this year in an appropriate manner," he said. The President said the country was at the doorstep of eliminating extreme poverty for the first time in memory and several people friendly programmes including equitable healthcare have begun to be rolled out. Road, water, rail and air connectivity has improved. "India has been united and integrated now it is being networked," he said.